When disconnecting the cable from the negative (-) battery terminal, initialize the following system after the terminal is reconnected. (a) The type of ignition switch used on this model differs depending on the specifications of the vehicle. The expressions listed in the table below are used in this section. (a) The navigation system uses an SD card (disc player disc) containing data such as map data. (b) Precaution for removing the SD card (disc player disc). The SD card (disc player disc) contains map data and various programs for the navigation system. Without the SD card (disc player disc) inserted, the navigation system will not operate normally. Therefore, remove the SD card (disc player disc) only when necessary, such as when updating the map data. After removing the SD card (disc player disc), do not insert any other object into the SD card (disc player disc) slot. When inserting the SD card (disc player disc) into the SD card (disc player disc) slot, make sure that the SD card (disc player disc) is free of foreign matter. After inserting the SD card (disc player disc), make sure that it is securely inserted into the SD card (disc player disc) slot. (1) Before removing the SD card (disc player disc), make sure that the ignition switch is turned off. (c) Precaution for handling the SD card (disc player disc). If a strong force is applied to the SD card (disc player disc), it may be damaged. 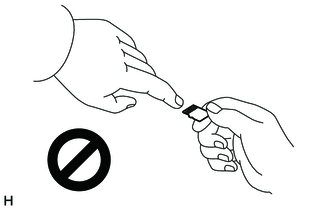 Do not leave the removed SD card (disc player disc) in any of the following environments. If the SD card (disc player disc) is affected adversely, it may result in a malfunction in the navigation system. Places where the SD card (disc player disc) may be exposed to direct sunlight. Do not use the SD card (disc player disc) if the label has peeled off or someone has put a sticker or other label on the SD card (disc player disc).